Praise for "Cows Can't Jump"
"Already on my list of all-time favorite picture books"
"Will fast become your child's favorite bedtime story." "Will become a classic of early childhood literature." "Just by reading these books, my son has managed to figure out how to deal with blows to his self-esteem." "Quickly embraced by my children. Grab a copy!" "5 Stars. A beautiful book. I love how it can help children appreciate all kinds of diversity." "So incredibly delightful to read and fun to look at. A wonderful bedtime story. A really great book to develop the love of reading!" "We adore this book and definitely recommend it along with Cows Can't Quack"
"Charmingly illustrated...inspiring message...a great book to read out loud"
"A delightful book for young children." "I highly suggest you check out both titles today!" "My daughter loved it from her very first read. A perfect book for preschool-aged children." "Your child will delight. Colorful and fun illustrations." "Illustrations are beautifully done and the wording is simple and catchy." "A fun book to read aloud to young children. Filled with action verbs. Very positive message." "I highly recommend this book for toddlers through early readers. It's entertaining when read aloud, and also has wonderful vocabulary for readers just starting out." "My girls just love this book and it has become a new staple in our daily reading!" "Perfect bedtime book. The expressions on the animals' faces, and the colors of each page are just astounding. This is as much an adult book as it is a kid book, it really is up there on my favorites list of kids' books!" "This vividly illustrated picture book will entertain your little ones over and over again." "One of my favorite children’s books. This could easily become a family bedtime tradition"
"A fun book to read aloud and perfect for playtime...will engage preschoolers and developing readers alike"
"The cutest book ever! It's so entertaining! From start to finish Cows Can't Jump is engaging, fun, silly, and just completely delightful. I don't think I've ever rated a book I've reviewed, but this one gets a full 5 stars out of 5." "You have to read this book"
"Delightful...bright and playful...fun for everyone...teachable moments on every page"
"Great book for beginner readers. I love the simplicity...it fits both of my children, ages 5 and 2." "My little boy loves this book. I had to read it to him ten times the first time I showed it to him. A great children's book!" "Perfect for engaging young listeners. - Making my children laugh while they are learning is an added bonus!" "Cows Can't Jump just makes me smile"
"This book works great as an early reader or as a baby book. I highly, highly recommend it!" "Hilarious. Parents will love sharing this quick fun read." "A fun story...fabulous bright and colorful illustrations"
"A sweet, cute, and hilarious book!" 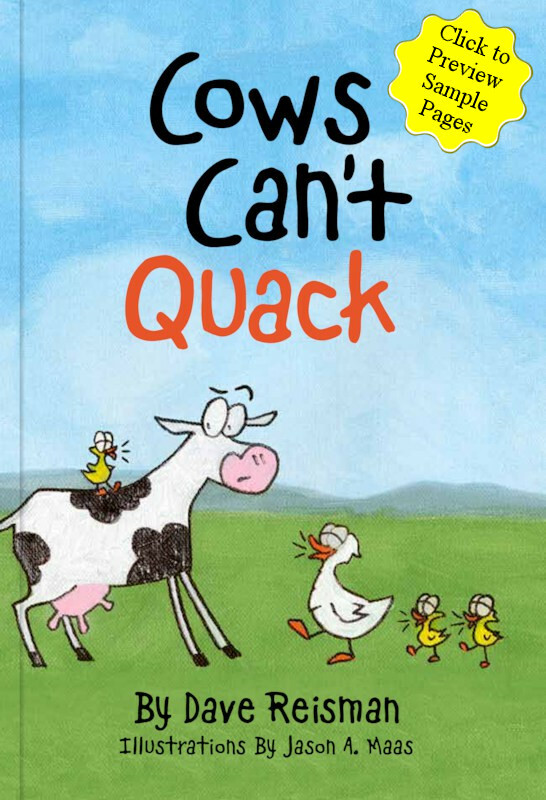 "I really love it...a great book"
Praise for "Cows Can't Quack"
"A winner for your toddler or early reader." "Great book to give to the kiddos in your life." "A fun read that will delight children from infancy through the early elementary school years." "Incredibly charming. A big hit with preschoolers and early readers." "Two fun filled books...both sure to become time honored classic picture books"
"I actually liked this book MORE than Cows Can't Jump. LOL." "Just as adorable and fun as Cows Can't Jump!" "Two of the most charming children's books you can imagine!" "Author and dad-of-three DR has done it again! This short and sweet book for preschoolers is fun and will have everyone smiling." "Delightful sequel to Cows Can’t Jump. I highly recommend Cows Can’t Quack"
"This one may be my favorite!" "Great book! Preschoolers will love both the simple, easy to understand sentences and the colorful pictures. Parents will love the message." "I highly recommend these two books. My little guy absolutely loves them both and so do I!" "My 4 year old grabs the book after I read it and says 'This is the best book!' Every home with small children needs a copy." "Another winner...definitely a book to buy and give as a gift." "It's very simple but that is what makes it so great. This book is easy to read again and again." "Both books quickly made it to the top of her favorites list!" "Absolutely adorable. Great for little ones just starting to read, they're a great length too"
"Simple sentences and silly colorful illustrations make learning and comprehending easy and fun." "A fun book to read to children. My daughter's friend clapped at the end and smiled throughout the story." "Entertaining read aloud...humorous illustrations and engaging text." "Good news. There is a sequel called Cows Can't Quack"
"Another book by DR that my son adores! One of our favorite books to read. Excellent bedtime story." "A great read. Both parents and children will enjoy it." "I highly recommend this book, AND it has a sequel - Cows Can’t Quack, a companion explaining the sounds that animals make." "My girls were just as thrilled with it as they were with Cows Can't Jump. It is perfect for my early reader." "Author DR and illustrator JAM did it again with another charming book that's suitable for any age." "What I love about this book is it can easily be enjoyed by a baby, or a preschooler, and everything in between. I shared this with my youngest son's speech therapists, since making animal sounds is a precursor to talking, and they loved it as much as I do." 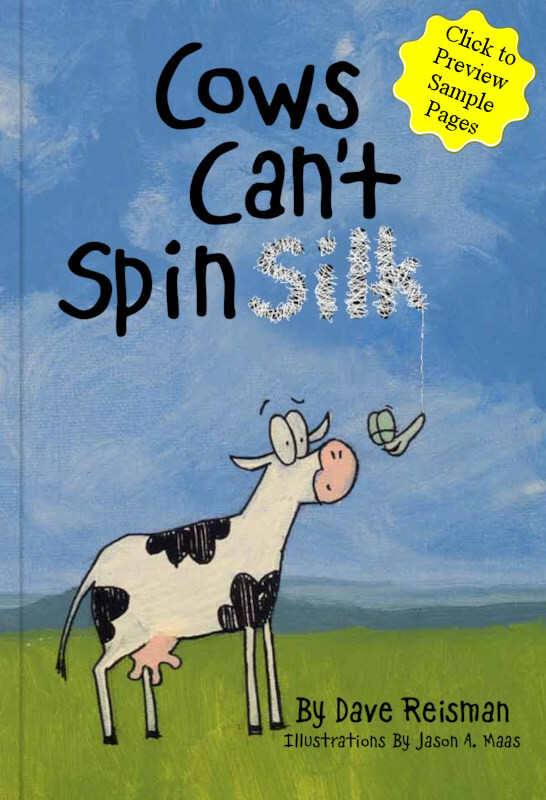 Praise for "Cows Can't Spin Silk"
"They aren’t just fun and educational, they also teach an important value… keep reading! "Dave Reisman has done it again with Cows Can't Spin Silk! It's amazing how my boys not only read these books over and over again, they also seem to embrace the animals as characters unto themselves." "My 3 1/2 year old is so excited there is a 3rd book in this great series (see Cows can't Jump and Cows can't Quack)! The theme throughout the series is wonderful: each animal has something they can't do but then something they CAN do. I think it's comforting to kids to see that everyone has something different and special to offer." "Wonderful new book in the series. My 15 month old daughter loves this book. We've almost worn out the first two and she was so excited to receive this new board book. This book introduces many new animals that she doesn't see in other stories as often. I'm sure these books will be a favorite in our house for a long time!" "The newest Parent-Child Home Program favorite! Younger children will learn new vocabulary, problem-solve -- and laugh too -- as they find out which animals can shape tools, form dams, or hammer holes. This is a simple, clever book that will get even the youngest children thinking and predicting what will happen on the next page."